Installation of audio-visual equipment on buses to announce bus stop information to riders who are blind or deaf. Comprehensive rehabilitation of train station elevators. Devoting more people and time to fix elevators when they break down. Placing information about hours when assistance is available for customers with disabilities at the passenger’s boarding and destination rail stations. Maintenance of a database of all ADA-related complaints to be used as guidelines for developing performance standards. Creation of a brochure for people with disabilities with all relevant information for safely and efficiently accessing the system. Monitoring of ADA-related performance by two full-time performance control specialists in wheelchairs. 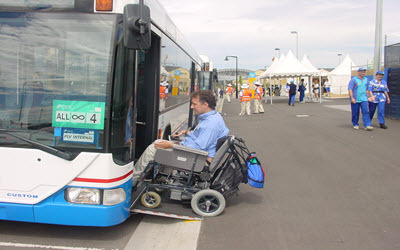 Arranging for alternate transportation for customers with disabilities when there are barriers to mainline transportation. Learn more about the CTA case settlement. Our client uses a wheelchair, is HIV-positive and had a stroke last year. He relies on a powerchair and door-to-door paratransit service to get around. He was allowed to use paratransit services at only certain times of the year. We helped the client appeal these restrictions. We encouraged him to get doctors’ notes to document any health complications that could arise if he did not have paratransit. And we drafted a letter with all the arguments he could make at the appeals hearing. The client used our guidance materials and the letter to make his arguments at the appeal. The result: Our client won full restoration of his paratransit eligibility. We assisted a woman with orthopedic disabilities who was granted only seasonal conditional status for paratransit service. She wanted to appeal this decision so she could receive taxi vouchers for hospital visits. Armed with information from Equip for Equality, she persuaded the paratransit provider to overturn its decision and grant the unconditional status she was seeking. To learn how to advocate for your rights to paratransit (door-to-door) service, read our guide, called ADA Paratransit – How to Make Your Case.